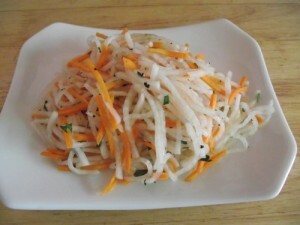 Diakon is basically a Chinese radish – it looks like a giant white carrot and has the texture of regular red radishes. You can find it in most grocery stores in the fresh veggie aisle. Shredded up, it produces a fantastic salad that is so easy to make. sprinkle of salt & pepper and small pinch of white sugar. Mix everything together and let the finished Diakon salad sit in the fridge for about an hour to allow the flavors to meld. Serve cold.